I shared a presidential debate fantasy in 2012 and a Texas sovereignty fantasy in 2011, and I even shared a fantasy two years ago involving about 50 percent of the population. None of those fantasies have become reality, and I suspect that the message of this Branco cartoon also is an unattainable fantasy. 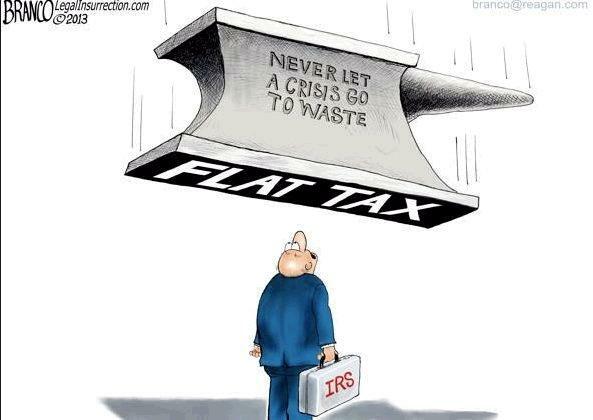 Simply stated, a flat tax would be a wonderful outcome to this latest IRS scandal. But for reasons I’ve already explained, I’m not holding my breath waiting for that to happen, either now or in the future. Doesn’t mean I’ll give up on the fight for tax reform, but I always try to be realistic. P.S. I’ve already confessed that I have very abnormal fantasies. And I have admitted on TV that my fantasies are rarely fulfilled. P.P.S. There is such a thing as a libertarian-specific fantasy. P.P.P.S. For fans of the national sales tax, I’d also be delighted to get something like the Fair Tax (as you can tell from my position in this debate), but I think a national sales tax faces even greater uphill odds than a flat tax. Merge FICA and Medicare taxes into the income tax and treat capital gains as ordinary income, and a flat tax just might have a chance. It would be more progressive than what we have while being simpler than typical Republican flat tax proposals.